Based on the Warfedale SFB3 and inspired by Troels Gravesen´s OBL11. 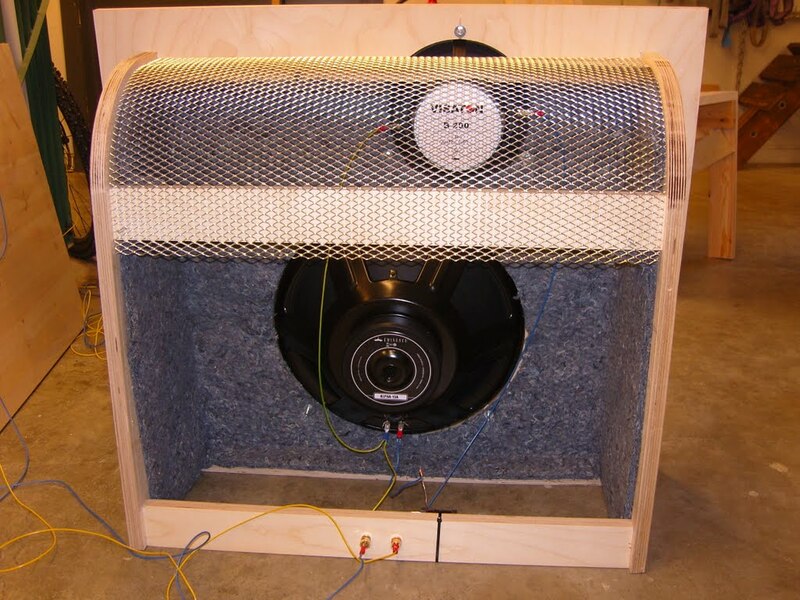 I have built a open baffle speaker based on the popular Visaton B200 and Eminence Alpha 15A combination. Here are some important links on these speakers. The video is by steadlocks on youtube. I did not have the speakers yet at this point so unfortunately their dimensions are not included. Anyway I got everything to fit. The side baffles barely cover the B200 so be careful about your tolerances when cutting the holes and mounting the speakers. Here are all the parts for one speaker. Edges are drilled and doweled, then glued. I cheated and used a professional circular saw and CNC machine at work. Lots of white glue and pressure! I will only be powering the speakers with a 1,5 to 8 Watt tube amp. For a crossover I have bought a Jantzen P-core inductor, 4.7mH at 0,3ohms. 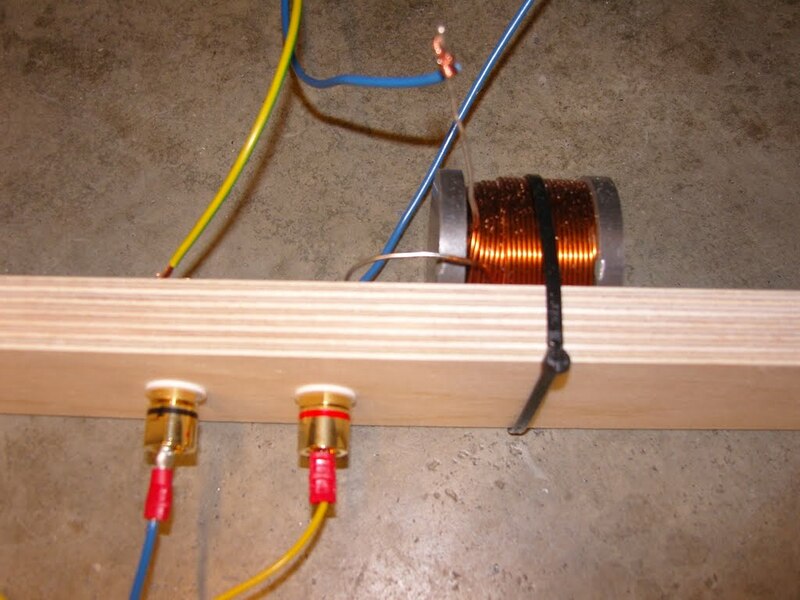 The plan is to connect the speakers in parallel and connect the coil in series with the Alpha´s positive pole. At a later date I may also try 1,2 mH in series, 220uF in parallel for Fc=500Hz as recommended by “painkiller” at Audio Circle. With the glue cured on both of them. I cut acoustic felt to size and stapled it to the inside of the cabinet. Mounted the speakers and wired them up in parallel, inserted the 4,7mH P-core coil as a first order low pass filter crossed over at ~200Hz. As a former for speaker cloth I stapled on some aluminum stretch metal for car styling, that I got from Biltema a Scandinavian car parts shop. You can also see that I ended up with the Visaton sticking out at the top. If you wait with cutting the baffle holes until everything is mounted you will be able to pack things closer together and avoid this. Further work: dress up the edge of the plywood. Find a way of permanently mounting the crossover components, once they are finalized. I will probably mount a bit of perforated fiber board where the coil is now, and strap it there instead. 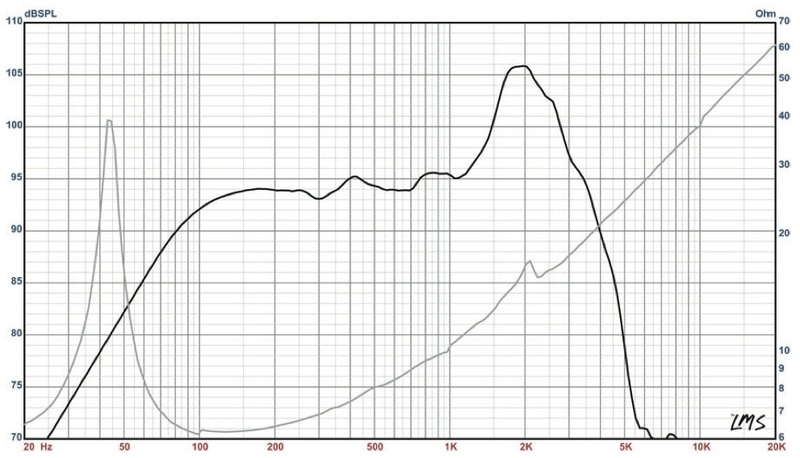 100 and 147uF clearly increased the focus on high tones in the speaker. It became somewhat nasal and thin bodied. Compared to no capacitor, the 200uF solution worked best, but it was still slightly more pronounced in the higher frequencies. 200uF reduced the cone displacement problem sufficiently. 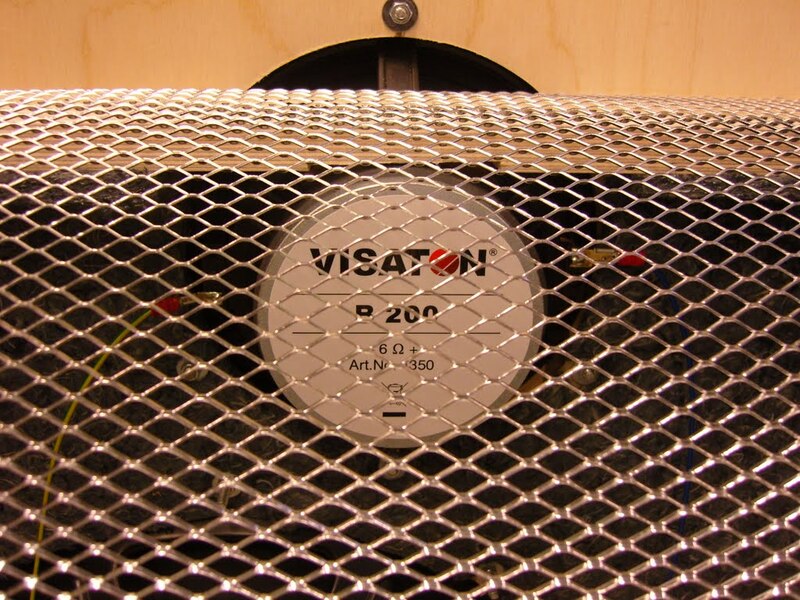 The conclusion is to run the Visaton B200 unfiltered for critical listening, then I might have a switch connecting 200uF in party mode when I expect high sound levels. 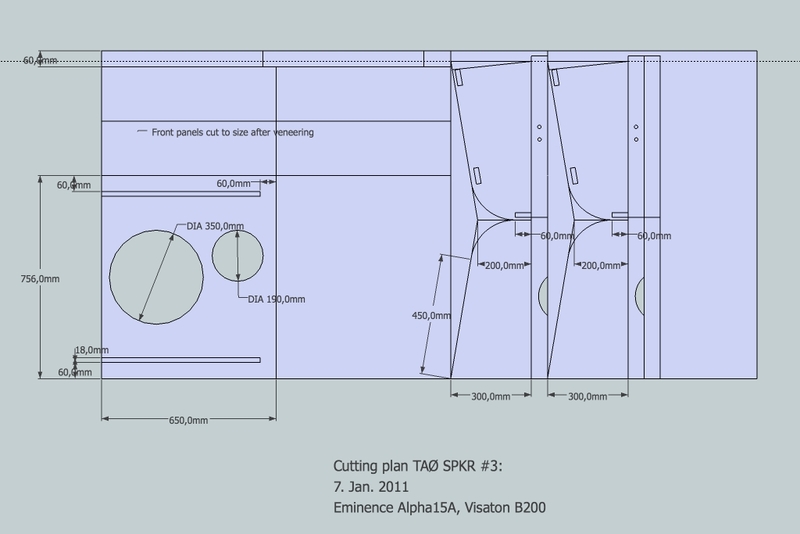 Tolvan Edge software should show me what is going on with this shape of baffle. I also plan to test them with HolmImpuse to see if I get a reasonable frequency curve. 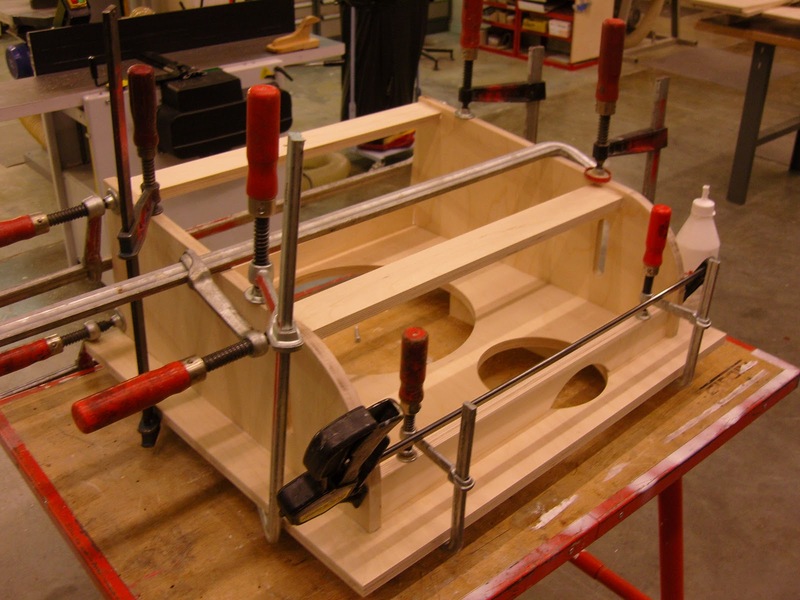 The next step is veneering the front and finding a suitable speaker cloth. 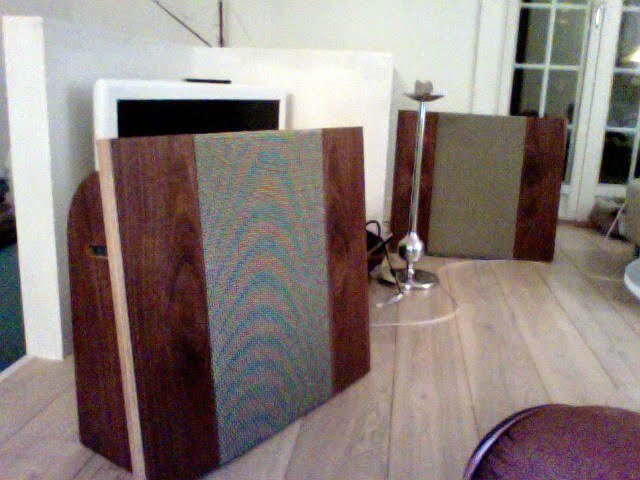 I decided on using American Black Walnut and TubeTown´s Marshall Salt & Pepper speaker cloth for the front panels. The veneer I used had a really large knot at one end. 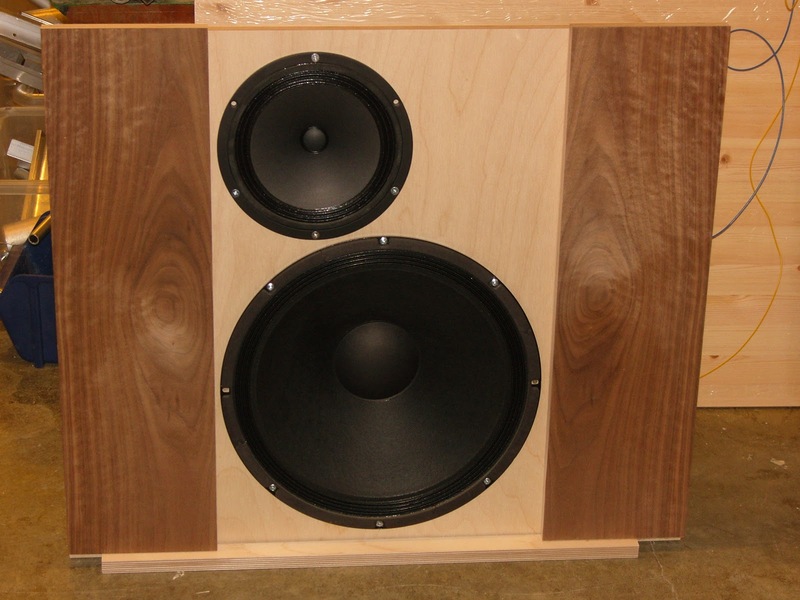 I decided to align the knot in the center of the panels to make a reference to the sound pressure from the speakers. 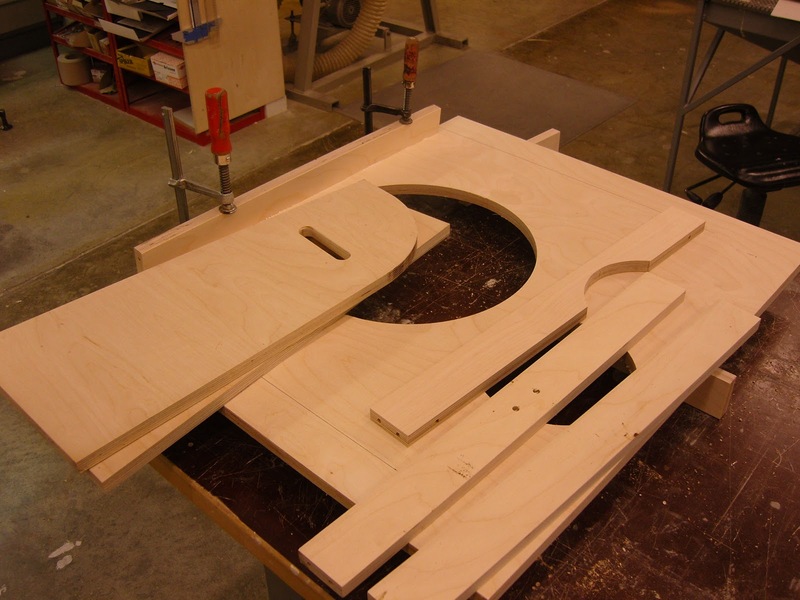 The panels were cut to size, then veneer and panels were sprayed with contact glue. Once the glue had dried 15-20 minutes the veneer was rolled on with a 10kg aluminum bolt that was lying around the shop. Here are the speakers with a first look at the panels. While I am waiting for the speaker cloth to arrive from Tube Town in Germany, I have been exploring ways of smoothing the rising response of the Visatons high end. 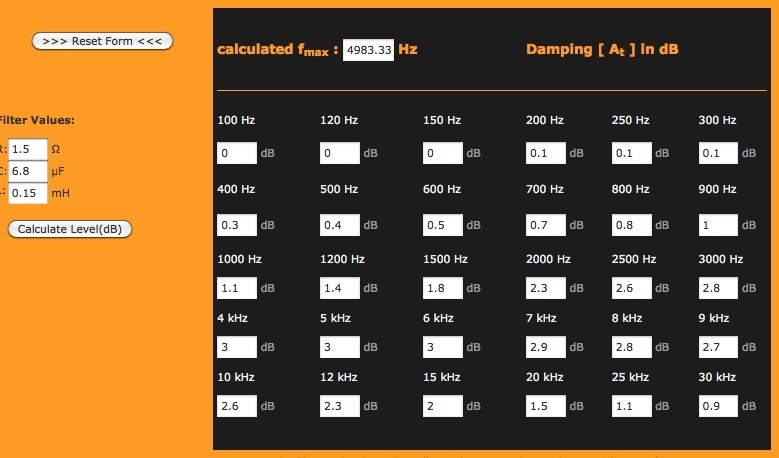 In the manufacturers response chart below you see that from 600Hz the sound level increases peaking at +10dB at ~7000Hz. My first approach is digital filtering. I have landed on the cheaper solution of using Hijack Audio Pro by RougeAmoeba. Although not as well described, technically, to assure you of high fidelity processing, Hijack has far greater flexibility than PureMusic. Hijack Audio Pro is based on plugins. 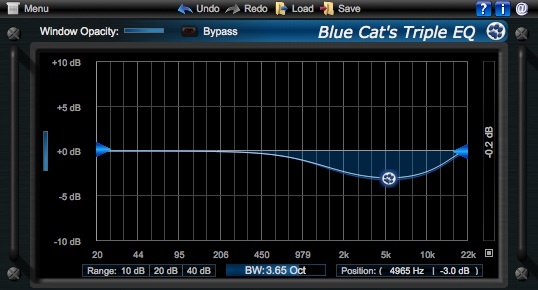 I have found BlueCatAudio´s plugins, FequAnalyst and Tripple EQ to be the most intuitive and helpful so far. I love the fact that I can work in each channel in isolation, add several corrections after each other and toggle on/off to hear what they are doing. The big deal maker, apart from price is that I can work on global sound out from the Mac, instead of just iTunes, and yes, they are mac 10.5+ and 10.6+ compatible. Grill cloth arrived! I cut a front panel of 9mm plywood. Stapled the grill cloth along two edges taking care to keep the treads lined up. Then using as much force as I could, stretched the grill and stapled the other two sides. The whole process took about 50 minutes per panel, and my fingers hurt! The grill was tight enough to bounce a coin about 10cm in the air. On the rear side I tried spraying the metal grill with gold paint. It worked out very well. 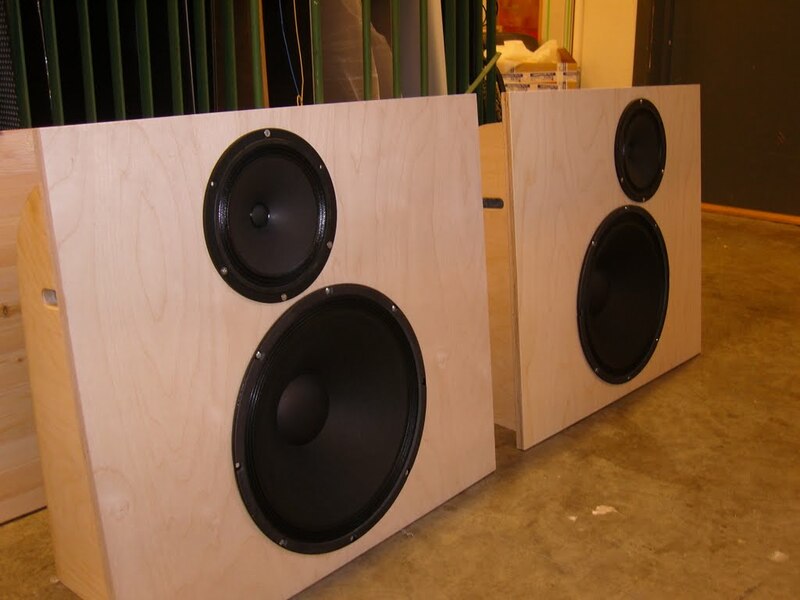 I have not decided if I will make a rear frame like on the Wharfedales. Here they are for the first time in my living room. Its late so I haven’t tried to line them up properly. But they are making nice music. I am playing CD´s from a Cambridge Audio D540 through a Audioromy FU13 amp. There is a light hiss and the strong highs of the Visatons otherwise everything sounds good. Now the time has come to explore filtering the Visatons rising highs. 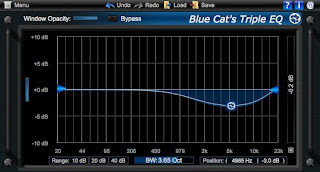 Using Audio Hijack Pro and BlueCatAudios free tripple EQ plugin I played around with all kinds of music and different settings. There is a careful trade-of to be made. Unfiltered the Visatons sound very clear and revealing, but on the irritating side. Once you start dropping the highs, things very quickly turn woolen and uninteresting. I can´t describe all the settings I have played with, because the process was too fast and creative. The result however is to just take the edge of the annoying highs of the Visatons using a parallel notch filter centered at 4900Hz, damping 2 – 3dB. Things are still clear and open, but the irritating part is gone, and I have not lowered the SPL to much to drive the speaker with a small amp. Now I am waiting for parts to arrive again, I ordered the capacitors and resistors from Dynabel in Oslo. The notch filter is installed and working as planned. 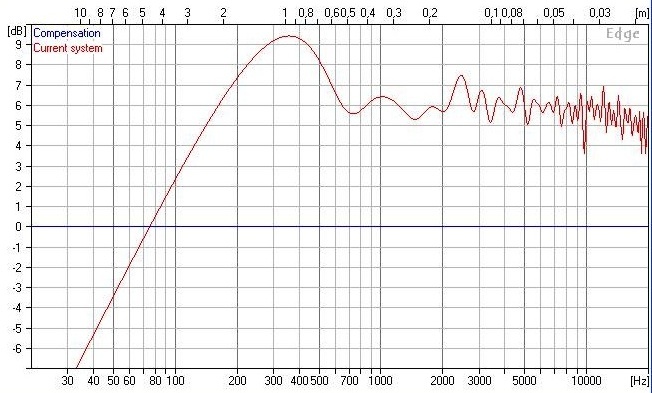 Below is a frequency and phase plot using HOLMimpulse, an uncalibrated diy WM61A mic and a calibrated, but bad old sound card. The dotted lines are the phase, while the full line is frequency. The sudden fall-off at 10kHz is due to the sound card stopping there. The sound card also drops of at about 20Hz, so don’t consider the extremes of the plot. The frequency plot i smoothed to 6dB increments. A raw plot is hairier. 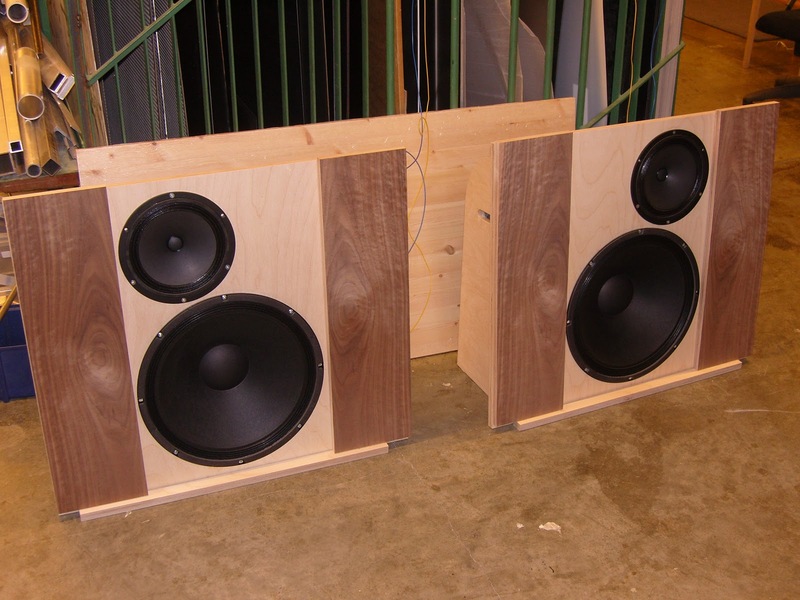 The measurement is done in my livingroom with one edge of the speaker along a solid wood railing to a staircase. This accounts for the rising bass. 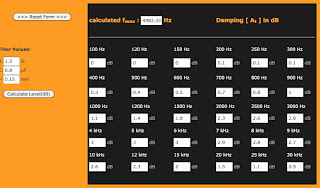 There is a worrisome dip from 600 – 700Hz otherwise I am happy with the result. The next picture is a simulation using Tolvan EDGE. 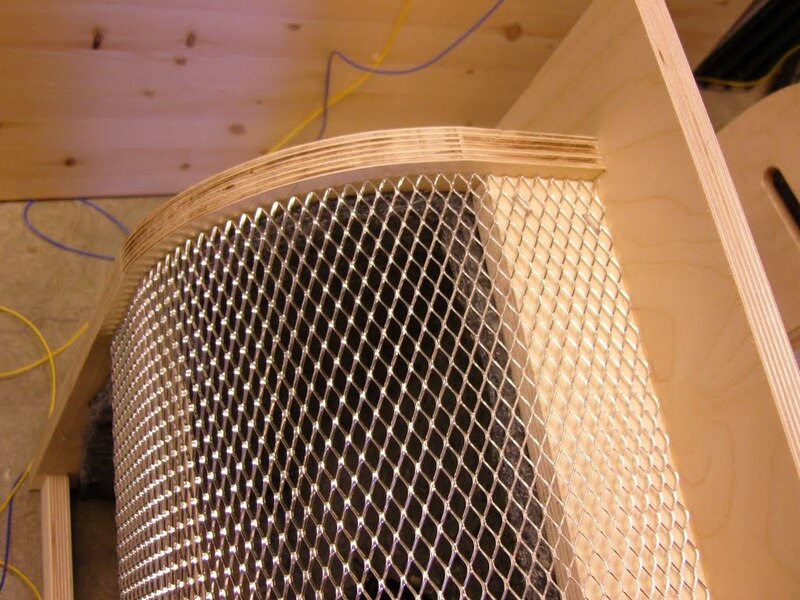 The Edge is a simulator for the “baffle step”, a consequence of the diffraction at the edges of a loudspeaker cabinet. It can not simulate two drivers with different diameter in the free version of the EDGE, so in stead of 300mm and 190mm diameter I have chosen 280mm diameter for both. Otherwise dimensions and speaker layout are the same. Comparing the two frequency curves you can see that Edge predicts an earlier increase and fall off in the low frequencies, than I have measured. 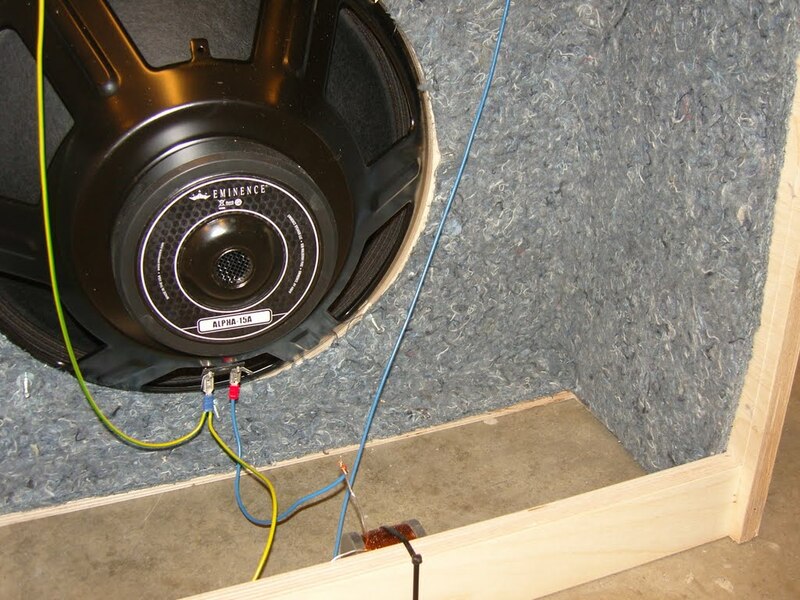 Factors contributing to the difference are that EDGE does not take speaker element and crossover characteristics into account, and that the baffle was bigger because it was standing by a one meter high wall. Room gain accounts for the rise in the lower frequencies. The longer baffle moves the simulated peak down to about 300Hz. There is still some mid freq. sound from the Eminence. Phase cancellation my contribute to the 700Hz dip. 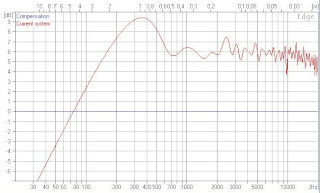 I would like to try a second order filter according to Kings OB design paper possibly with a higher crossover frequency. The parallel notch filter takes the edge of the Visatons, I might experiment with more attenuation, just for fun. As the speakers are today they sound strong in the low frequencies, they have a forward mid to high without being annoying. The result is a lively engaging speaker, that rocks, plays classic music an female jazz voices just as well. I´m happy I built it! The problem with the first order low pass of the Alpha 15 is the huge frequency hump at 2 K. with first order lowpass , you only really move the hump dow to the normal level of the Visaton, and this ruins some of the imaging and dynamics of the visaton. So I have ordered parts for a second order filter for the Alpha 15. 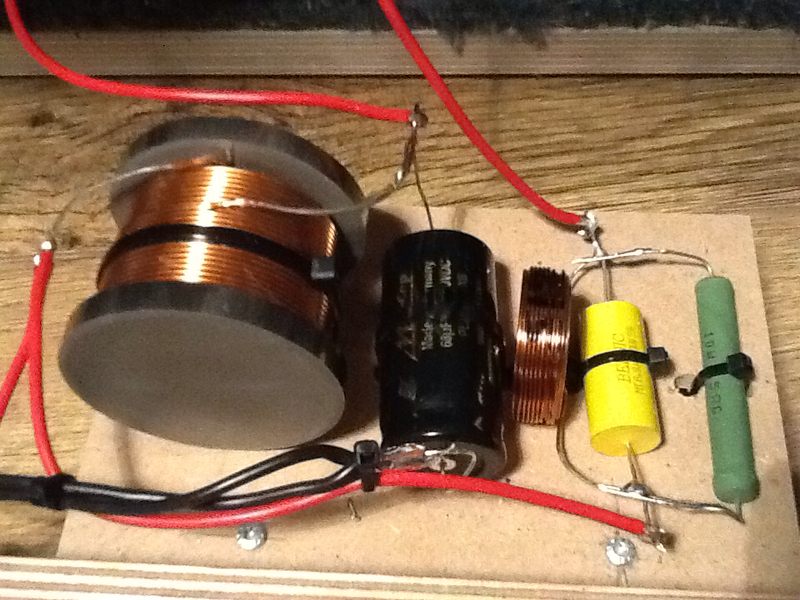 68uF capacitors and 8,2mH coils which make a 12dB reduction per octave from about 215Hz. Similar values to what Martin King recommends in this illustration from his paper (see above). Later I will test it and post a new curve. I have been busy with RC planes and helicopters since december, so there has been little progress here, but today I installed the second order lowpass for the Alpha 15 and the notch filter for the Visaton. It tried out several resistor values of dampening, but ended with a carefull 2 ohm to just take the edge of the Visaton top, without loosing any trebble distinction.